Now you’re probably wondering what this historical anecdote has to do with genomics. Rest assured it won’t morph into a Wonka-esque account of morality sung by dozens of oppressed, orange-faced little people. Put simply—the tale is to highlight the idea that there are many great combinations in the world and when put together the results can be ethereal, such as chocolate and peanut butter or something more pragmatic and invaluable such as the merger of powerful ideas like genomics and immunotherapy. “The use of genomics in immuno-oncology is really exploding,” remarked Richard Chen, M.D., chief scientific officer at Personalis, a precision medicine company utilizing next–generation sequencing–based clinical diagnostics. “Every tumor is genetically and immunologically different in ways that can significantly affect how it responds to immunotherapy.” Personalis offers researchers and clinicians DNA sequencing and interpretation of human exomes and genomes using its Accuracy and Content Enhanced (ACE) platform. “Genomic approaches like our ACE ImmunoID platform can be used to more comprehensively to characterize the immune genetics of tumors, including neoantigens, tumor escape mechanisms, and tumor immune microenvironment,” Dr. Chen added. 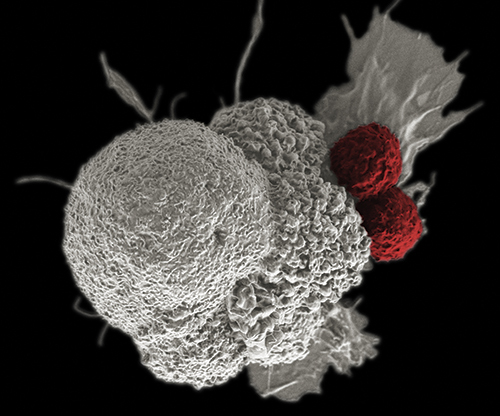 With the approval of several immunotherapy drugs over the past few years, the immunotherapeutics field has enjoyed its share of successes and disappointments. For instance, checkpoint inhibitor drugs—those that target the various pathways related to T-cell activation, proliferation, and induction of tumor cell death—have been effective in treating melanoma, non-small cell lung cancer (NSCLC), and ovarian cancer. Yet, a significant fraction of patients fail to respond to these therapies, which frequently lead to severe complications—a major factor in these therapies often being used as last resort treatments. However, scientists are hopeful that new and ongoing genomic studies will be able to provide insights into better treatment options. The pharmacogenomic efforts could identify specific genetic backgrounds that are sensitive to immunotherapy drugs, as similar efforts have for other chemotherapy regimens.